A couple months ago, I mentioned that my friend had begun crocheting cute little animals as part of her daily project for the year. When I saw that she had put a Winnie-the-Pooh up in her Etsy shop, I immediately jumped on it. (Pooh Bear was my absolute favorite character growing up.) Then I saw her little koala and I adopted it for Alex due to an inside joke we developed early on after watching this YouTube video on our first date. She'd named him Toby, by the way. Cute - looks like Toby had fun too! My sister and I have a mini Uglydoll that we like to photograph doing various things. And I've wanted to learn to crochet just so I can learn to make adorable tiny animals. I feel a little strange saying this, as I've never met you and I'm not a regular commentor, but I'm happy that you and Alex found each other. You deserve to be happy! I've seen various version of this theme, but never actually played around with the idea. It was fun! 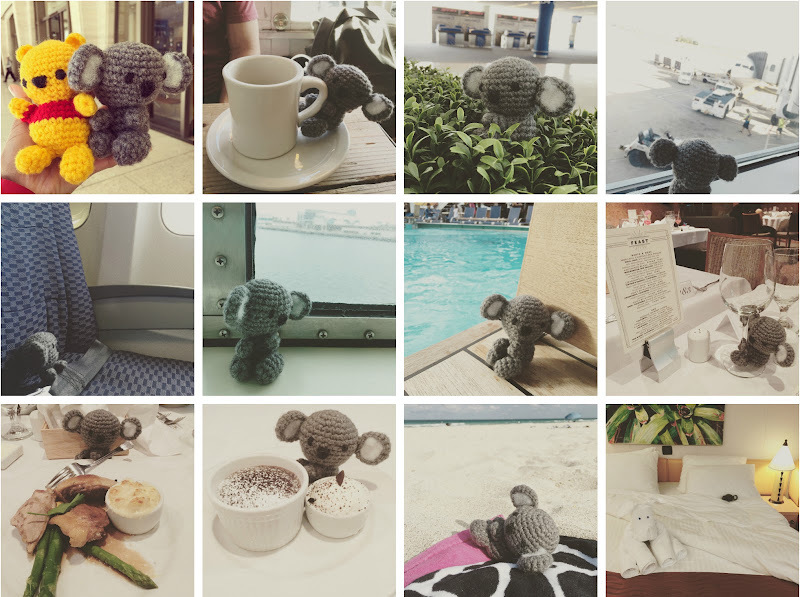 Though I have to admit the little koala got left behind in our room for 80 percent of the adventuring we did. And you saying that is not weird at all. I'm really enjoying things right now...and it's such a wonderful relief. Thank you for wishing me well and for lurking around all these years. I really appreciate the support and kind words even if from afar. Hope you're having a fantastic summer, Carrie! I'm sure if he could talk he'd say he had a blast...and to actually let him taste any of that food.